1. Grass founder can happen after eating too much fresh green grass. TRUE. Grass founder can happen for two reasons. First, the excess carbohydrates (sugars) in the grass can cause digestive upset, which often leads to laminitis. Second, grasses under stress often produce high levels of a type of sugar called fructans. Horses cannot easily digest fructans, and the sugars end up in the large intestine where bacteria multiply and break them down. The overgrowth of the fructan-digesting bacteria upsets the normal balance of the digestive tract and produces toxins that lead to laminitis. 2. Fructans are high in grass right after a rain and not a problem during dry weather. FALSE. Grasses produce fructans after photosynthesis, which is dependent on sunlight. Grasses are actually lower in fructans during cloudy weather. 3. Grass founder or laminitis is only a problem in spring and fall, when grass is lush and growing most rapidly. FALSE. Grasses produce fructans when stressed, which can be the result of drought, frost, or rapid growth during intense sunlight (especially after a rain). 4. Laminitis-prone horses are safe in pastures that are not fertilized or maintained.FALSE. While I prefer horses to be grazed on unfertilized, native grass pastures, grasses in nutrient-poor soil are often under stress and produce high levels of fructans. Since steadily growing grasses tend to deplete their fructan levels (which is a good thing), regular mowing to encourage this kind of growth can help control fructan levels. Regular mowing also helps control weeds. 5. Overweight and insulin resistant horses are the most susceptible to laminitis from grass. TRUE. Overweight horses develop a mechanical form of laminitis from excess pressure on their laminar attachments (structures within the hoof that support the bones in the hoof). 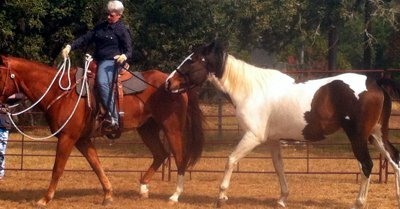 Insulin-resistant horses may or may not be overweight, but are prone to grass founder or laminitis. Signs of insulin resistance include a cresty neck and unevenly distributed fat over the withers and base of the tail. 6. Hay never contains harmful carbohydrates. FALSE. Hay can contain up to 30% fructans depending on the weather conditions when the hay was cut. Hay cut in the afternoon on a sunny day will have higher fructan levels than hay cut in the morning on a cloudy day. Hay that was rained on between cutting and baling will have the lowest fructan levels because rain washes excess fructans out of the hay. Cool climate grasses such as fescue, bromegrass, ryegrass, orchardgrass, and quackgrass tend to have higher fructan levels, while drought-resistant grasses such as bermuda, switchgrass, bluestem, and Indian grass have lower levels. All pasture grasses have the potential for high fructan levels under the right conditions. 7. The safest time to turn out laminitis-prone horses on pasture is late at night or early in the mornings, when the grass is not in a flowering stage of growth or stressed by drought or frost. TRUE. As stated above, these are periods when grass would contain lower fructan levels. Grazing muzzles are another good alternative for horses that must be left on pasture. Ideally, having a dry lot where you can keep your horses during critical times is best. If hay causes a problem because of high fructan levels, consider soaking it for 30 minutes to an hour before feeding to wash out some of the offending carbohydrates. Beet pulp is another safe source of fiber for horses who are sensitive to carbohydrates. Many thanks to Kathryn Watts for her very informative website www.safergrass.org. Many horses will be spared the horrors of laminitis as a result of her sharing of this information. If your horse has already been a victim of laminitis, you can find holistic options for treatment in my laminitis e book.